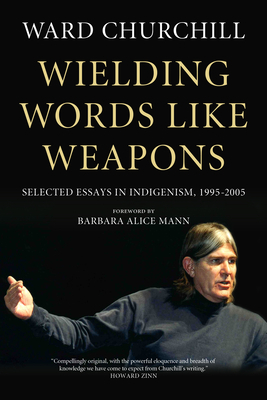 Wielding Words Like Weapons is a collection of acclaimed American Indian Movement activist-intellectual Ward Churchill’s essays on indigenism, selected from material written during the decade 1995–2005. Beginning with a foreword by Seneca historian Barbara Alice Mann describing sustained efforts by police and intelligence agencies as well as university administrators and other academic adversaries to discredit or otherwise “neutralize” both the man and his work, the book includes material illustrating the range of formats Churchill has adopted in stating his case, from sharply framed book reviews and review essays, to equally pointed polemics and op-eds, and formal essays designed to reach both scholarly and popular audiences. The items selected, several of them previously unpublished, also reflect the broad range of topics addressed in Churchill’s scholarship, from the fallacies of archeological/anthropological orthodoxy like the Bering Strait migration hypothesis and the insistence of “cannibologists” that American Indians were traditionally man-eaters, to cinematic degradations of native people by Hollywood, the historical and ongoing genocide of North America’s native peoples, questions of American Indian identity, and the systematic distortion of political and legal history by reactionary scholars as a means of denying the realities of U.S.–Indian relations. Also included are both the initial “stream-of-consciousness” version of Churchill’s famous—or notorious—“little Eichmanns” opinion piece analyzing the causes of the attacks on 9/11, as well as the counterpart essay in which his argument was fully developed and garnered honorable mention for the 2004 Gustavus Myers Award for best writing on human rights. Less typical of Churchill’s oeuvre is an essay commemorating the passing of Cherokee anthropologist Robert K. Thomas, and another on that of Yankton Sioux legal scholar and theologian Vine Deloria Jr., to each of whom he acknowledges a deep intellectual debt. More unusual still is his moving and profoundly personal effort to come to grips with the life and death of his late wife, Leah Renae Kelly, thereby illuminating in very human terms the grim and lasting effects of Canada’s residential schools upon the country’s indigenous peoples. Ward Churchill (Keetoowah Cherokee) was, until moving to Atlanta in 2012, a member of the leadership council of Colorado AIM. A past national spokesperson for the Leonard Peltier De-fense Committee and U.N. delegate for the International Indian Treaty Council, he is a life mem-ber of Vietnam Veterans Against the War and currently a member of the elders council of the original Rainbow Coalition, founded by Chicago Black Panther leader Fred Hampton in 1969. Now retired, Churchill was professor of American Indian Studies and chair of the Department of Ethnic Studies until 2005, when he became the focus of a major academic freedom case. Among his two-dozen books are the award-winning Agents of Repression (1988, 2002), Fantasies of the Master Race (1992, 1998), Struggle for the Land (1993, 2002), and On the Justice of Roosting Chickens (2003), as well as The COINTELPRO Papers (1990, 2002), A Little Matter of Geno-cide (1997), Acts of Rebellion (2003), and Kill the Indian, Save the Man (2004). Ward Churchill (Keetoowah Cherokee) is a former a member of the leadership council of the American Indian Movement of Colorado. He is a former professor of American Indian Studies and chair of the department of ethnic studies at University of Colorado–Boulder. Among his two dozen books are the award-winning Agents of Repression, Fantasies of the Master Race, On the Justice of Roosting Chickens, and Struggle for the Land. He lives in Atlanta, Georgia. Barbara Alice Mann (Ohio Bear Clan Seneca) is an associate professor in the Honors College of the University of Toledo in Toledo, Ohio, and is the northern director of the Native American Alliance of Ohio. She is the author of 13 books, including the internationally acclaimed Iroquoian Women: The Gantowisas, Daughters of Mother Earth, George Washington's War on Native America, and The Tainted Gift. She lives in Toledo, Ohio. Barbara Alice Mann (Ohio Bear Clan Seneca) is a Ph.D. scholar and Associate Professor in the Honors College of the University of Toledo, in Toledo, Ohio. She has authored thirteen books, including the internationally acclaimed Iroquoian Women: The Gantowisas (2001), George Washington’s War on Native America (2005), Daughters of Mother Earth (2006, released in pa-perback as Make a Beautiful Way, 2008), and The Tainted Gift (2009), on the deliberate spread of disease to Natives by settlers as a land-clearing tactic. She lives in her homeland and is the Northern Director of the Native American Alliance of Ohio. Ward Churchill (Keetoowah Cherokee) is a former a member of the leadership council of the American Indian Movement of Colorado. He is a former professor of American Indian Studies and chair of the department of ethnic studies at University of Colorado–Boulder. Among his two dozen books are the award-winning Agents of Repression, Fantasies of the Master Race, On the Justice of Roosting Chickens, and Struggle for the Land. He lives in Atlanta, Georgia. Barbara Alice Mann (Ohio Bear Clan Seneca) is an associate professor in the Honors College of the University of Toledo in Toledo, Ohio, and is the northern director of the Native American Alliance of Ohio. She is the author of 13 books, including the internationally acclaimed Iroquoian Women: The Gantowisas, Daughters of Mother Earth, George Washington's War on Native America, and The Tainted Gift. She lives in Toledo, Ohio.